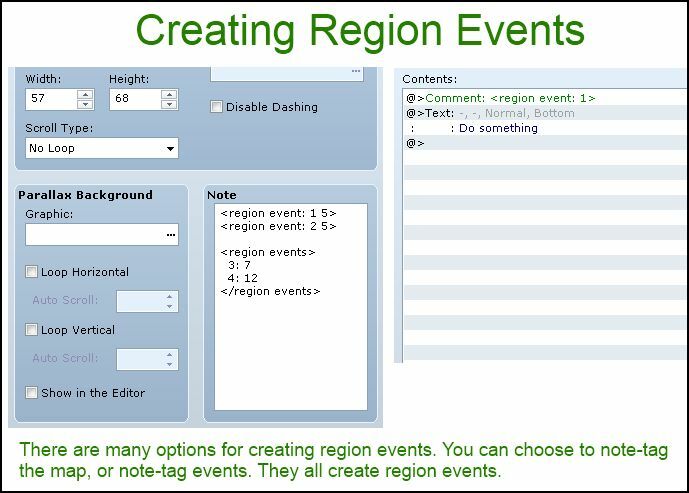 This script allows you to create “Region Events”. Basically, it allows you to turn an entire region into an event based on an existing event on your map. For example, suppose you have some Region 1 tiles. Using this script, you can connect Region 1 to an event on the map. The result is called “Region Event 1”, and when you activate Region Event 1, it will run the event it is connected to. Region events obey all event rules. They do not have a graphic, because they are simply regions on your map. Region events are useful when you want multiple tiles to all run the same event. Region events obey event trigger rules. If the region event is activated by “action trigger”, then players must press the “OK” button in order to activate the event. Similarly, if the region event is activated by “player touch”, then the player can activate the event by walking onto the tile. Region events obey priority rules. If the region event is “same as character”, then you can activate it when you stand in front of it. If the region event is “below character”, then you must stand on it to activate it. Region events obey page conditions. region 2 might reference event 2. Simply add more note-tags for each region as required. It is just an alternative if you prefer that over individual note-tags. 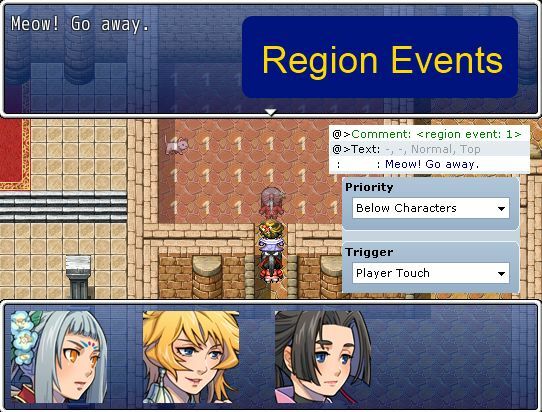 The second way to creating region events is to note-tag events themselves. Note that the event ID used will be the ID of this event. This means that when region event 1 is activated, it will run event 3. This is exactly what I’ve been needing for my game! There is one map in particular that required a great deal of duplicate eventing to get done what I needed. Now that you’ve made this, I should be able to make it much less of a load.